If you want a shed that has a great look then the Emerald Anthracite Metal 8 x 6 Shed may be perfect for you. 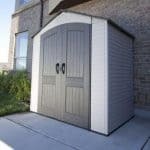 This is a very unique looking kind of shed with a dark grey look that is finished off perfectly with that silver trim that goes around those large doors. These are no ordinary double doors, these are sliding doors which are very practical and also very fun. This may look huge, but at 8 X 6 this is a shed that will fit in gardens of all shapes and sizes. So it is perfect if you want some storage, but do not have a lot of space for a big shed. Galvanised steel cladding is what the shed is made from. This in its own right is very good, but it is also finished off with an anthracite coating. This is what gives the shed its dark grey look, but this is also a very strong material that requires no maintenance and will not rot, crack or decay as the years go by. The whole shed is made very well and has a very robust feel to it. It is the kind of shed that you can install and then just leave be as it requires no upkeep at all. The Emerald Anthracite Metal 8 x 6 Shed is a very interesting looking shed. As it is finished with anthracite it has a very striking appearance. This along with the silver trim really does make the shed stand out. In many ways it more resembles a workshop than a shed. The width of this shed is 8 feet 4 inches which is very nice. The depth is 5 feet 8 inches which is right around what we would expect. This is a more compact sized shed, but we feel that with the right organisation this floor space can go very far. The eaves height is 5 feet 5 inches and the height along the ridge is 6 feet 8 inches so the headroom on offer is right in line with what other similar sized sheds are offering. We love the apex roof they have used for this shed. It is made with the same kind of galvanised steel as the rest of the shed so it fits very well. The rain is always going to run off at the sides so there is no worry about it sitting on top or even running down where the door is. Also right below the roof on the front are some air vents which will help keep things nice and comfortable inside the shed. 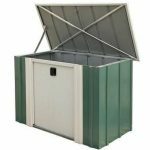 Galvanised steel that is finished off with anthracite is what the Emerald Anthracite Metal 8 x 6 Shed is made of. This is such a great combination and it makes the shed very strong and also pretty much maintenance free. The colour is a very dark grey, almost black and we think that it looks fantastic. It really does resemble a workshop where cool contraptions are kept. The cladding is supported very well inside the shed and we feel that this is likely to be one very strong and secure shed. It is the kind of shed that when you touch it, you are impressed with just how solid it feels. The frame is not actually something they say much about, but from the pictures, you can see the frame is securely attached to the metal walls. There is no flooring included with this shed. 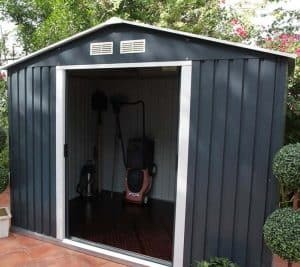 This is something that is not totally out of the norm for a shed like this, but they do not even offer any kind of flooring options which is a little confusing to us. This means you will need a wooden or concrete surface to install this shed on as we really do not think installing it on grass is a very good idea. 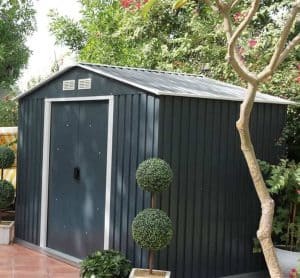 You do not have to worry about buying a can of wood treatment for the Emerald Anthracite Metal 8 x 6 Shed as it requires no maintenance at all. 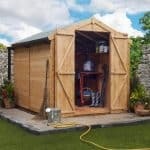 This is a huge selling point and we are sure it makes this a very attractive shed to those who do not want the hassle of having to remember to treat the shed every year. 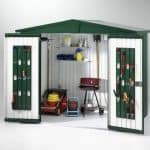 The Emerald Anthracite Metal 8 x 6 Shed comes with a ten year guarantee. The reason they are able to give such a good guarantee is that the anthracite finish will not crack or show any kind of decay as the years goes on. Ten years is right around what we would expect for a shed so in all we are happy with the guarantee here. Some of the people in the WhatShed office are, let’s just say a little on the geeky side. They think the fact that this shed has sliding doors like in Star Trek is really cool! It certainly is very different and it does make getting in and out that little bit easier. The height of the doors is 5 feet 3 inches and the doors are 3 feet 7 inches wide. These double doors are a little smaller than we are used to, but 3 feet 7 inches is still enough room to get larger items in without too much trouble. We must say that the silver trim round the doors looks awesome, they really did a fantastic job here with that trim and it gives the shed a great look. The Emerald Anthracite Metal 8 x 6 Shed does not have any kind of windows so you may want to have a think about having some kind of LED light just in case you need to be in here when it is dark. As this is made with galvanised steel as you can imagine this is one very strong shed. It is very secure and solid so we are sure you will have no concerns about storing expensive items in here. One thing we will say is that this does not come with an actual lock. But the way the handles are designed, you could always add in a padlock or even a chain if you want. As there are no windows this is a shed that is offering 100 percent private. Unless you have been messing around sliding the doors open and closed and have forgotten to shut them. 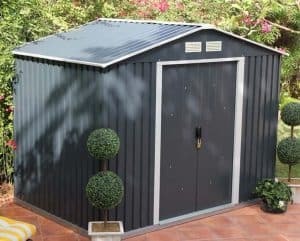 The Emerald Anthracite Metal 8 x 6 Shed does not have any customisation options at all, but to be fair given the materials this is made from that is what we expected. A couple of extras are on offer with this shed. 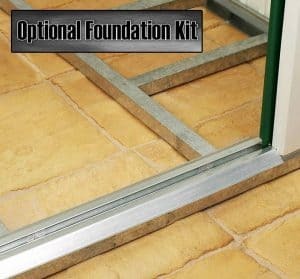 First of all we have the Steel Foundation Kit which is ideal if you plan on securing this to a concrete or decking area. This does cost £102 which is a little high for us. The other extra they have is an installation service, but at £599.99 it is horrifically overpriced. 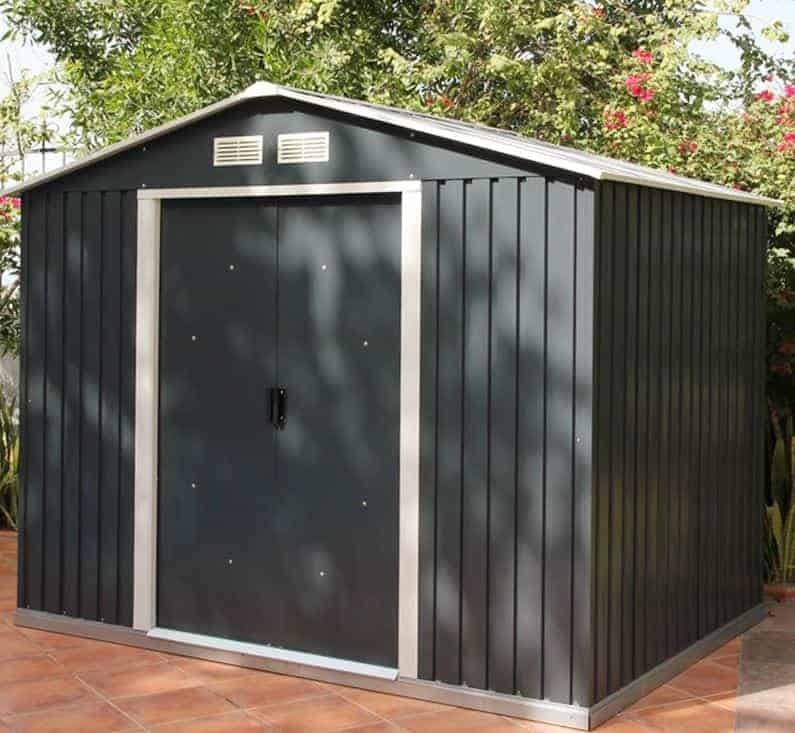 With galvanised steel cladding, a solid frame, sliding doors and that anthracite finish, this is a shed that is very high quality from top to bottom. We just wish that it had a floor. This is going to give you many years of use. You do not even have to worry about treatment or any issues with rot or decay. 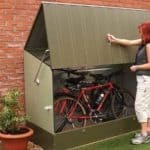 Any shed that is 8 X 6 is going to require you to be a little crafty with how you store things, but in general we feel this is a good size for a compact shed. This is quite a straightforward installation job, but you will need another person to help you out. 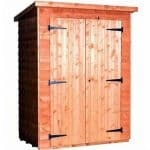 As far as the more high end 8 X 6 sheds go this is good value for money. We just think they could have included some kind of flooring with it. While we may not be over the moon at the lack of a floor, the Emerald Anthracite Metal 8 x 6 Shed just does so many things right that it is impossible not to be impressed by it. The anthracite finish may look really cool, but it is also going to really protect that galvanised steel cladding from the elements. The roof is also made from this material so all throughout this is one very robust shed. The doors may not be the largest, but the fact that they are sliding doors is great as it makes getting in and out that little bit easier. In all this is a fantastic 8 X 6 shed. Just make sure you consider what you are going to do about the floor before you buy it.